I went to the orthopaedic surgeon for a follow up appointment on Friday and got some great news--he was really happy with how strong my foot is getting and how it felt overall! It's just been all around positive news from doctors lately and that makes me so happy. I can finally walk without crutches, mainly only at places like work and at home because I am still limping! It turns out that my calf muscle is really tight and prohibiting me from walking normal. That explains the middle of the night cramping I have been experiencing in my calf and foot in general. Not fun. My physical therapist rubbed my calf out on Friday and found some pretty painful trigger points. I took full advantage of being able to walk freely this weekend by doing things like laundry, dishes, and baking on Saturday morning. I had this bag of ugly looking, but perfectly good apples from my mom and dad's apple tree to use up. I only used up four to make an apple crisp. The crisp tasted wonderful with a nice cup of coffee. Just how I like to spend my Saturday mornings--drinking coffee, baking, and then munching on what I just made. 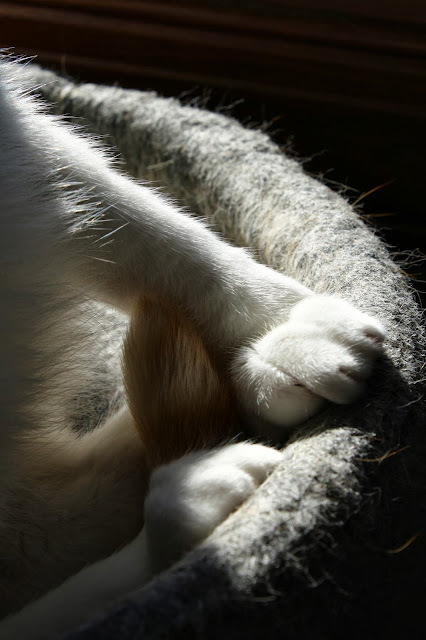 In typical fashion, I bugged Tanzi and pet his paws a lot. When I went shopping for eMeals recipe ingredients at Target, I also picked up a few other things and shopped for clothes. I decided to try out the Cartwheel app to save some more money off of my purchase. It was super easy to use and I highly recommend it. I had pre-loaded some coupons for things I knew I wanted to purchase, like laundry detergent. When I was just about done shopping, I searched in the app for items like, "floss," and found 5% or 20% off of almost everything I was buying, since I tend to purchase a lot of Target brand items. I saved more than $3.50 just with this app, plus I saved another 5% off because I use a Target credit card. I don't think I will ever grow tired of Target. Craig and I had more apples to use up, so we peeled and sliced for a good hour on Sunday morning and then he threw the slices into our dehydrator. I made a yummy smoothie with About Time chocolate powder I won from Nicole at Apples and Arteries and it really filled me up. I added two bananas, almond milk, some ice, and fresh greens to the mix. I had learned about pea protein on Dr. Oz recently and was happy to read that this product is plant based and made from proteins from peas, pumpkins, and brown rice. The Dr. Oz show highlighted how pea protein was especially satiating. Before heading over to Craig's parents' house this afternoon, we stopped at a new Dunkin' Donuts in New Berlin and got some free drinks! It was National Coffee Day on Sunday, so I got an iced coffee for free and Craig used my birthday coupon to get an Orange Coolatta. I ended the weekend with a solo walk around the neighborhood. I limped a little, but I did pretty well. I really missed taking walks. I learned about haggis, onions in recipes, mayonnaise, and cheese while listening to one of my favorite podcasts--America's Test Kitchen. Have you used apps like Cartwheel to save more money at the store? If so, which ones? I am interested in trying out more apps like that, especially because I don't have to cut out coupons. I am not the best meal planner, so to have someone else do it for me is perfect. eMeals reached out to me and offered the opportunity to try their service out. It was really easy to log onto their website and choose to get vegetarian meal plans for two people. I was very excited to see that they even had a vegetarian option, as I was thinking I would have to modify some meat based recipes. When I looked around some more, I was also happy to see that they also offered such a huge variety of meal plans, such as: paleo, low carb, clean eating, classic meals, Mediterranean, slow cooker, low fat, portion control, natural and organic, simple gourmet, and gluten free. Over the last couple of weeks, I have received a number of recipes and grocery lists. I chose to shop for two recipes that sounded like something I wouldn't normally make on my own. I went shopping at Target and Trader Joe's on Saturday and found everything I needed to buy to make Tempeh with Peanut Sauce and a Lentil and Avocado Salad. I enjoyed having a comprehensive shopping list, especially if I wanted to make all of the recipes in one week and could just highlight what we needed to buy to accomplish that goal. 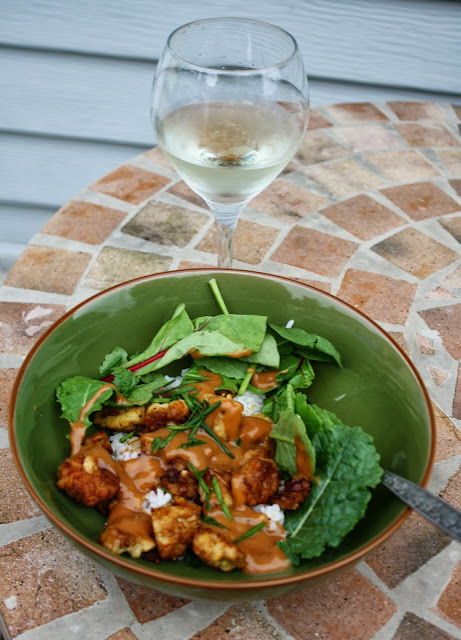 Once home, I got the recipe for Tempeh with Peanut Sauce out and started following instructions and gathering ingredients. I love this tempeh from Trader Joe's! I was very impressed by this dish! I kept saying "mmmm..." and "this tastes like it comes from a restaurant, but better." To get some greens in my diet, I added some kale, spinach, and chard mix on the side. The recipe suggests adding broccoli, which I'd like to do when I make this again. What an excellent and easy meal to make! All of their recipes include ingredients I mainly already have and look so feasible to make on a busy weeknight, etc. I can't wait to make the Lentil and Avocado Salad later this week! It sounds really delicious and I'll be sure to share how it turned out. If you are a blogger and want to try out eMeals too, click here! Thanks to eMeals for reaching out to me and providing me this service for one year! I look forward to using it get more creative in the kitchen and to take the stress out of cooking and meal planning each week. eMeals provided the service and I purchased the food for this post on my own. Receiving the service complimentary did not influence my opinion of this product. I got the iPhone 5 in June and along with that, purchased one new app and downloaded some for free thanks to a promotion running in honor of the anniversary of the iTunes store. Over the weekend, I also switched to iOs7 and I love it so far! I love the mapmyride+ app and this is one that I got for free with the iTunes promo. Before I downloaded it, I thought it was just for bike riding and then discovered I could use it to map and track mileage of my walks and runs. I've used it a couple of times and find it really intuitive. I love knowing how long we walk on our neighborhood strolls. I received the PressReader app for free and used it in Europe and ever since then to keep up with the news. I decided to cancel my subscription to the Milwaukee paper and this app has allowed me to keep up with news via the Chicago Tribune, Washington Post, etc. I really enjoyed reading this article, naturally! The Feedie app was recently featured on the ABC Nightly News and I think it's a great concept. It was created by Mario Batali and here is how it works: "Post an image of your meal at a participating restaurant across the U.S. via Feedie and the restaurant contributes to a non-profit group called the Lunchbox Fund. The fund, which provides meals to orphaned and vulnerable children in South Africa, matches it with a meal at a table a world away." It is perfect for a food blogger! We share pictures of our food all the time and now we can do it and give to someone in need of a meal. So far, not too many US restaurants are featured on the list as participating, but check it out and see if there is one in your area. Other most used apps include Instagram, Facebook, twitter and feedly! I now read most blogs through feedly, which makes it difficult to comment, but I often save a post to flag it as something I want to go back and comment on. What are your favorite apps lately? I received the PressReader app for free, but this did not influence my opinion of the product. Over the weekend, Craig and I went to the Doors Open Milwaukee event. Basically, a bunch of really cool historical buildings are open to the public and there are tours of places all weekend. This was our third year attending. Since I am still hobbling around, we only visited two places. Our first stop was to Jones Island. We both had always wanted to get there. Unfortunately, the way the actual tour was advertised was totally different than what was offered. Fail. Next year, we will go to City Hall and pick up tickets for a 60 minute tour. For lunch, we just headed to the cafe at Outpost Natural Foods in Bay View. I was craving a healthy meal and not really feel like sitting down in a real restaurant. 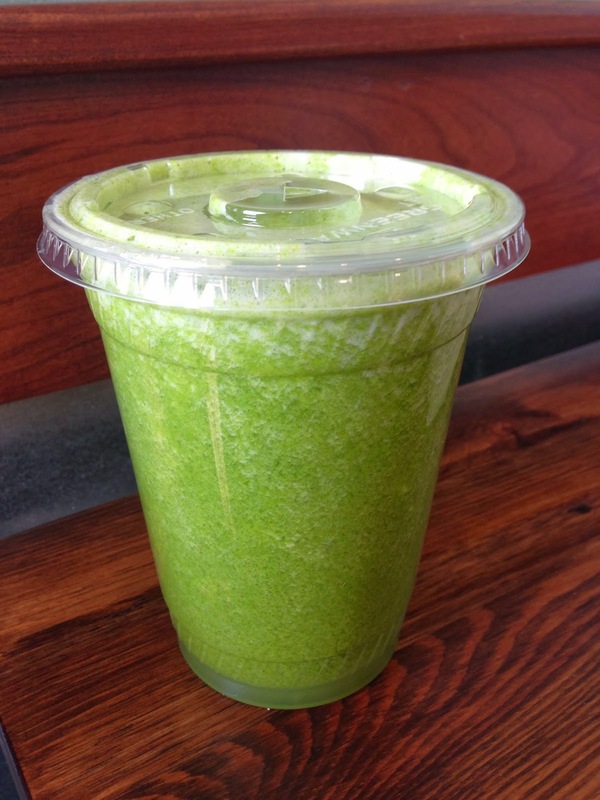 We shared a Kale Kiwi juice and it impressed both of us with its' unique and refreshing flavor. I had a delicious egg and vegetarian sausage sandwich with cheddar cheese. Craig ordered a breakfast burrito with bacon, which was exactly what he was craving. Between 1915 and 1917, Wright designed a series of standardized “system-built” homes, known today as the American System-Built Homes, an early example of prefabricated housing. The “system” involved cutting the lumber and other materials in a mill or factory, and then brought to the wite for assembly; thus saving material waste and a substantial fraction of the wages paid to skilled tradesmen. There were other FLW houses on the same block and I loved their designs. The house we toured was quite small, but included a lot of built-ins and illusions to make it feel bigger. It was Craig's first visit to a FLW structure and I am glad we both got to see this historic house. We are already making a list of places we want to visit during the Doors Open event next year! It continues to be a way to force us to be tourists in our own wonderful city of Milwaukee. Happy Monday! I've got a great giveaway for you today from Gardein (garden + protein = Gardein)! Gardein creates healthy foods made from a blend of non-GMO soy, wheat, pea proteins, organic ancient grains and vegetables. I have been buying Gardein products for a couple of years now and we love them in our household! This is one of my favorite products to throw on top of salads or in wraps. What are your favorite back-to-school recipes for your kids' lunches or for dinners after school/work is over? If you don't have anyone in your household who went back to school, check out Gardein's recipe page and let me know what you would make if you won. I think the breakfast wrap sounds great for kids or adults before the school/work day. 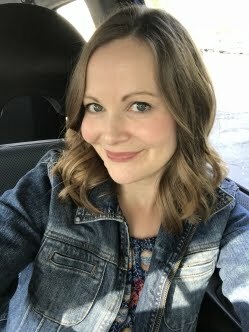 Follow Lisa Living Well on twitter. If you already follow me, just leave a comment saying you do. Follow Lisa Living Well on Facebook. If you already follow me, just leave a comment saying you do. I'll pick a winner on Friday, September 27 at 8 p.m. CST and e-mail the person directly, so please include your e-mail address in your comment. You will have 48 hours to respond and then I will pick a new winner. The winner was Mary! Congrats!!! Thanks for entering. 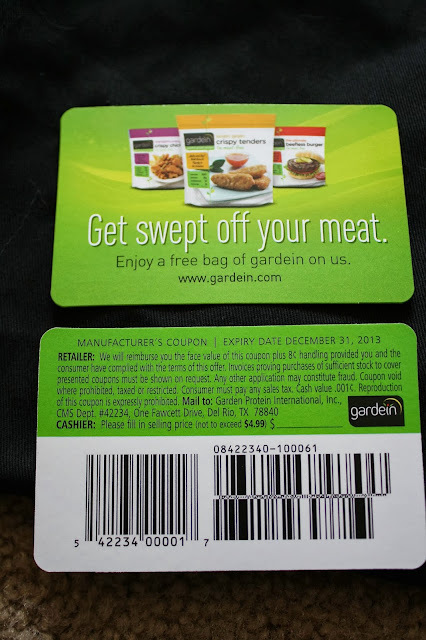 I received a kit from Gardein to review. This has not influenced my opinion of their products. The product and promotional item were provided by Barefoot Wine & Bubbly for this review. I love a refreshing wine this time of year, even as the temperatures get cooler. Naturally, I was excited for the opportunity to try two new wines from Barefoot Wine & Bubbly. Since I love Riesling wines, I opted to try the Crisp White and I found it to be delicious. It was on the drier side compared to the other wine I tried, Perfectly Pink. I could see pairing this with a great vegetarian kabob or protein and grilled vegetables. It featured fresh aromas of pear and melon and a lemon-lime finish. I absolutely loved Perfectly Pink and will definitely be buying this in the store. It was refreshing, sweet and so tasty. I think the fruity tones of mandarin orange and peach notes pleased my palate, along with the subtle raspberry and cherry flavors. I tried both of the wines chilled. 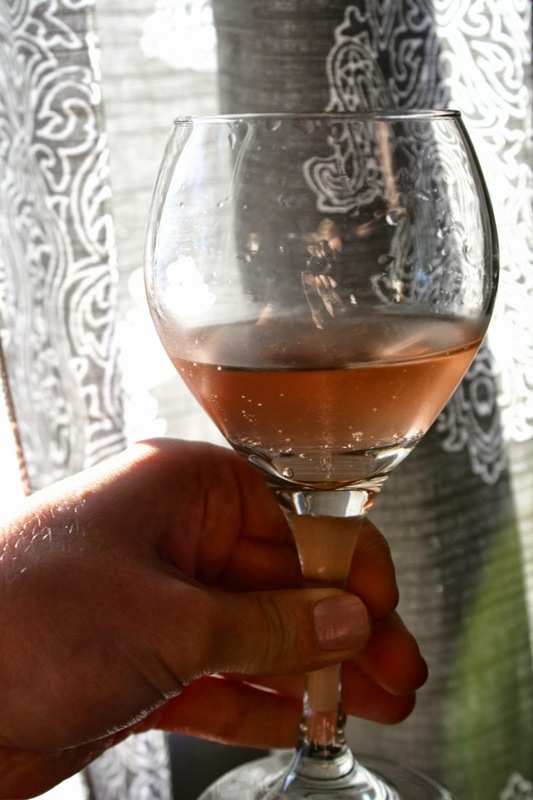 I could see bringing both wines to a picnic outside or having the Perfectly Pink served at a girlie party! The Crisp White would be fantastic with some Wisconsin cheese and olives. They are cork free, so it would be easy to just pop them open outside and enjoy along a lake on a hot summer day or in the fall, while nestled among the fall foliage. I definitely prefer this type of refreshing wine to other alcoholic drinks and I think the $8 price tag is very reasonable. 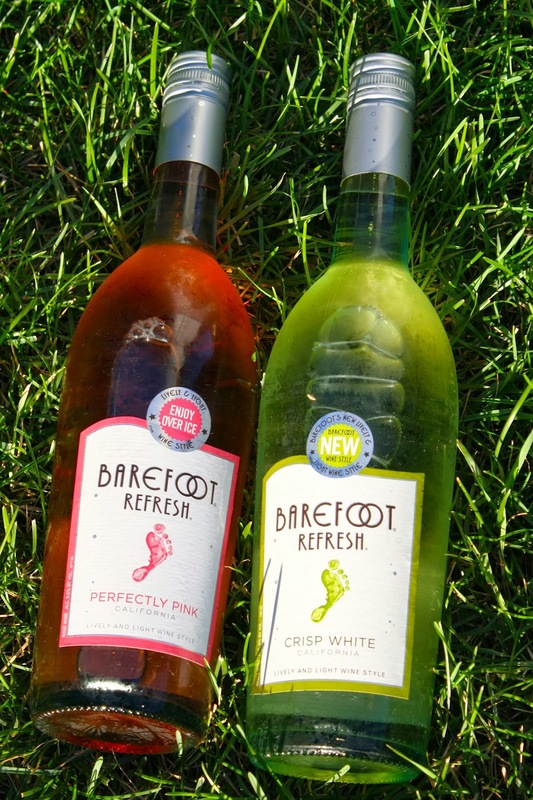 Thanks for letting me try Barefoot Refresh, Barefoot Wine & Bubbly! I am still holding onto summer and this wine is helping me do just that with it's refreshing nature. Back in Rothenburg, Germany, we walked into the Castle Gardens and from afar, I spotted a four legged friend up on one of the trellises. Don't let that pretty face fool you. This cat was quite the character and made my day(s). Total cat lady right here and I don't care one bit. Obviously, my mom and I walked over to the cat very quickly so we could "meet her." She proceeded to walk away from us and be aloof, as cats often are. All of a sudden, she started to fall and then grabbed onto the trellis with her claws. I wasn't sure about grabbing her, since she was an outdoor cat and I didn't want to get scratched. 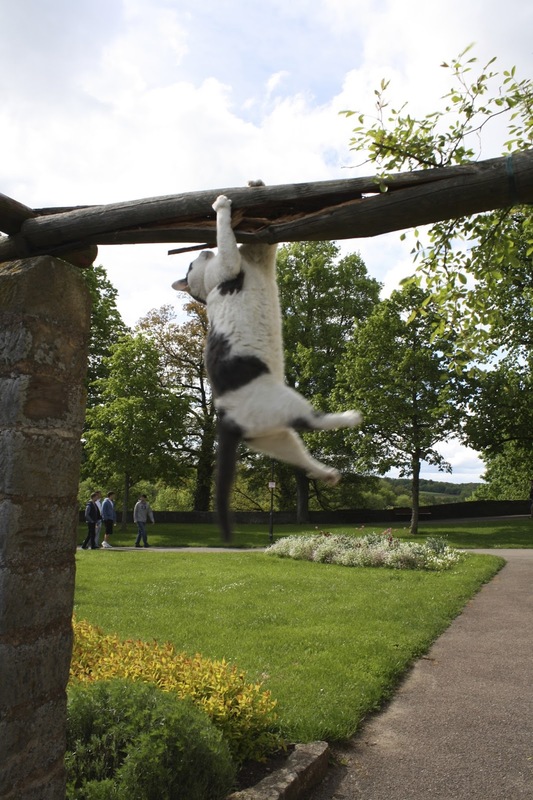 Luckily, the kitty got her self back up and held on in this manner until a nice tourist came along. He helped us out by getting her down and told me that he had six cats at home. He must have sensed that we were frightened about how she'd react to us if we tried to help. 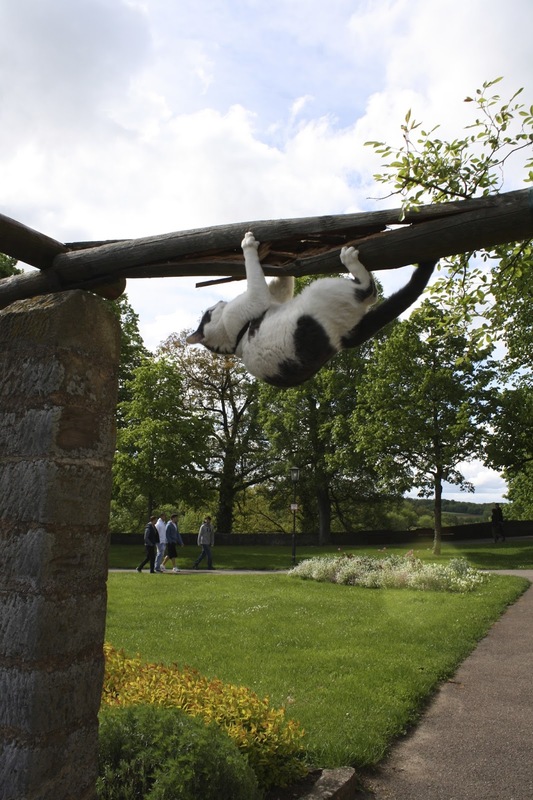 People were actually gathered around the gardens, watching the cat hang there and were fascinated by her antics. Back on the ground, I tried to get her to look at me and she wanted nothing to do with me. I keep calling her a "she" because I suspected it was a girl from her belly. I think she may have been pregnant. Tanzi has a little fat belly too, but it didn't look like hers. 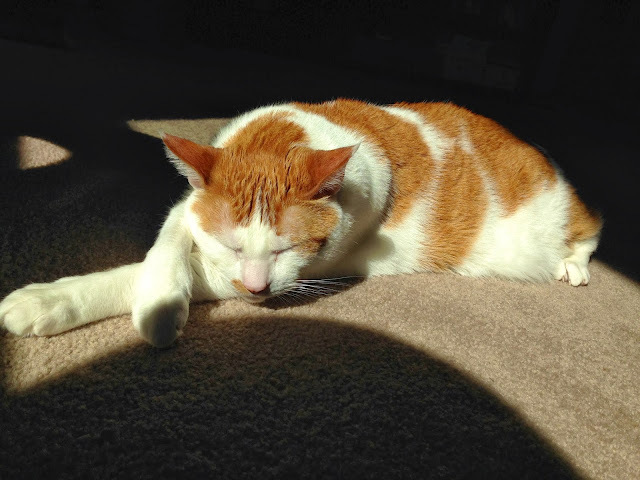 Have you run into cats while traveling overseas? I know they're quite common in Greece, so I definitely need to get there someday!